The weekend is upon us. Got stuff to do? Oh, wait. Now you do. Check out these two free festivals, one Saturday, one Sunday! 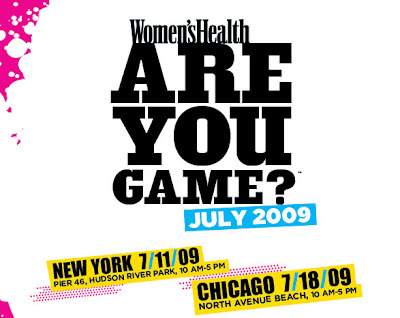 Women’s Health’s annual free summer festival, Are You Game? is geared towards women, but I’m sure plenty of men will be attending, if nothing else, to crowd watch. Snicker, snicker! --Workout Classes including: Masala Bhangra, Million Dollar Knockout, Hula Hoop Pilates, and more! --And MUCH MORE for the thousands of expected visitors! In celebration of High Line’s opening season, Target is sponsoring the Target High Line Street Festival. Come marvel at the World's Largest Lemonade Stand – in a 1,300 gallon custom-built Rosenwach water tank. The event will also feature inflatable sculptures, a reincarnation of the West Side Cowboy from the Federation of Black Cowboys, body painting, and performances by the Hungry March Band, Zona Del Barrio, and Michael Arenella and his Dreamland Orchestra, among many others. An exciting array of hands-on activities including a special Target "Hi from the High Line!" photo postcard booth, a "recycled trees" sculpture created with the Children’s Museum of the Arts, and a Greenmarket: Youthmarket presented with the Council on the Environment of New York City, featuring corn roasting and cider making demonstrations and treats from local providers add even more fun to the day's activities. Internationally-acclaimed balloon sculpture artist Jason Hackenwerth will be on hand working on a large public balloon sculpture of flowers and giant insects, and silk-screen artists will help guests create their own free t-shirts, featuring images by artist Michael De Feo. The Festival will feature a reading of Peter Brown's The Curious Garden, a New York Times best-selling children’s book inspired by the High Line, and on which the Festival's graphic was based.